AutoMattic Transmission: What is Theatre For? "Imagine you met a woman and learned that she'd had a 35-year-old brother who was lost at sea. Would you find it more moving to look at snapshots of the man enjoying his yacht, or to listen to a unique memory that conveyed the siblings' special bond and something of the vanished brother's character? Live theatre, when it works best, pulls you into its dramatized reality in a way that's not mind-based. Theatre is not journalism, personal essay, slide show or speaking engagement. Chances are, it's storytelling that would stir your emotions." I respect Alison Mayes' opinion - she and I have chatted a bit about theatre, among other things - and I haven't seen Lost to form my own opinion (going this afternoon). 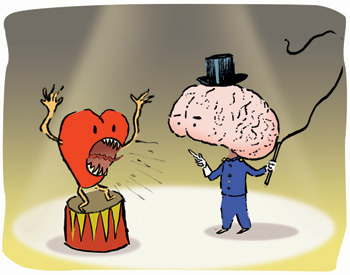 But I'm a little concerned about the theatrical divorce she's suggesting between the heart and the mind. Or if not divorce, perhaps trial separation? It's true that plays should resonate emotionally. Good stories tug on your heart, almost by definition. But I've come to see theatre as a forum of ideas and shared realizations, with audience, playwright and actors working together in a quest for some nugget of truth about human existence. In the same way that therapy is less about emotional release and more about an increased understanding of yourself, I think theatre is more about understanding your place in the evolving human story. If that's done honestly, courageously and (here's the tricky part) skillfully, the ideas will pack emotional punch. Just like good journalism, personal essays and slide shows (... maybe not slide shows) can be move the heart. Perhaps a different metaphor for theatre than therapy would help? Here's a Shaw quote that Leonard Conolly dropped during his "Why Shaw Matters" lecture at the beginning of the Master Playwright Festival (which you can listen to online). As an AWOL son of the church, I absolutely love it. "The theatre is as holy a place as the church and the function of the actor no less sacred than that of the priest." What do you think? What's the ideal balance (or symbiosis) of heart and mind in theatre? Did you ever see a play that combined both successfully? How's your ShawFest going?